Added a link, and updated StringW.d to v0.3. Added Deja's D.Net link to the side menu, and from his posted messages I've read on the D forum...it sounds like he's really making some good progress with it. Also I updated the StringW.d file to v0.3 with a few more useful functions. On the D front, Walter has been very silent the pass 20 days since his message, for everyone to post their top two issues that should be in the D v1.0 release? And if I didn't know better, I would venture to say that he's going to come out with a v1.0 Beta very soon... either in this next update or sometime in the very near future afterwards. Cross your fingers! StringW.d ... std.string functions for wchars!!. Yeah Baby! With my recent project I've been trying to expand my ( bright :)) ) horzions beyond the char 8-bit universe, and use "D" to write code that's more useful to the "D" International Community by using wchars. Which just a few short months ago, I had decided to change to "D" as my secondary programming language from "C", because of its fantastically simple use of build-in strings, its minimum need for pointers, and while still retaining the "Full Power of C!!" Updated project progress, and a couple of more examples of D code. I've finally updated my "Create random employee based test data for a database" project, now that I'm beginning to gain some speed and making some real progress toward this project. Also, I'm very thankful that Walter took the time to put in the ifind() and irfind() functions ...it's always good to have some standard functions in Phobos to work with. I've added windchill() and "Easter Dates function" examples to the "Basic D Tutorials" page. Added a sub-project support page. Well, I've finally completed converting some headers for Win32 API calls to ODBC32.dll, namely sql.d, sqlext.d, sqltypes.d, and sqlucode.d. I'm sure at this point they aren't perfect, but I hope over time and use, that I will make them perfect... as errors / mistakes are found, I do plan to fix them and update the code dowload link. Also I've added isacc(), a 32-bit general purpose pseudo-random number generator which looked pretty nice onto the "Basic D Tutorials" page. 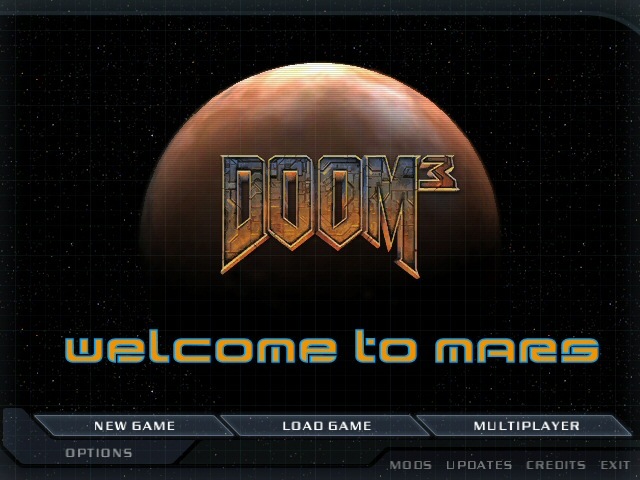 DOOM 3 battle on Mars, and the current D aka Mars is at v0.98. Well DOOM 3 is finally here!! Yeah, Baby! And it was truly worth the wait...if you're not playing it, you're really missing out on a great game. Though the version 0.98 seems to suggest that v1.0 is very close and around the corner (and it still may be), expect to see Walter continue into the v0.100 series of numbers. Causes from what I've seem on the D forum, there appears to be a few remaining bugs to be stepped on, plus the Phobos runtime Library is to get some tender-love-and-care just before v1.0's released. But if the eMail I got from Walter recently, about adding code to std.string that I wrote is any indicator...I'd say he's giving it some focus now. So v1.0 could still be just around the corner! :)) So, keep coding, and have fun doing it! Added a D Programming 101 section, and finished converting wincon.d. Added a Tech References Section. Well, I've finally decided to open up a new section to my long time passion..."Programming!" Though I've been programming professionally in MS Visual Basic and Borland "C/C++" for years, I never felt the need to add a section to my site, not with all the other sites on the Web covering these Languages quite well. But, then I found D!! Which reminded me of the time I had longed forgotten about, of when I discovered that Borland's Turbo Pascal had Strings just like Basic did, and I didn't have to deal with tons and tons of "Byte Arrays" to do them...well D has Strings too (Oh! Happy Day!!) in the form of "char" build right into the language...which is something I've always wanted in C (I never really cared for the C++ BString Classes and what-not! ).